Storrow Drive. We all love it. The road is notorious for speeding and aggressive driving because there's nowhere to be pulled over, creating a free-for-all environment that's rare in Boston traffic. Along with uncomfortably narrow lanes and very limited visibility on the incredibly short entrance ramps, Storrow's driving pleasures can't be underestimated. I once saw a man thank another driver by saluting him. But with only a singular digit. Odd, I thought. 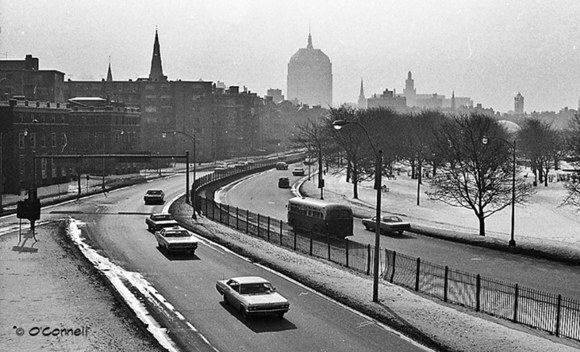 In this photo by Ed O'Connell we see Storrow Drive in different times. This is 1963. There is no Pru. Buses travel freely along the drive. What's more, even though the sun is high and bright, the traffic is lean and fluid. Can this be? Suffice to say it was but can be no more. Time can't be placed in a bottle nor can toothpaste be returned to the tube, so we have the Storrow Drive of today and it's not the future we envisioned. Despite a plethora of signs warning of low clearance, that's not enough for a bunch of truckers who have jammed their cargo under overpasses, causing backups for miles lasting hours. One time a load of scissors was released from a stuck truck which resulted not only in the backups and the hours wasted but those who took immediate advantage of the clearance efforts were rewarded with flat tires. Good times. For the record, neither James Storrow nor his wife ever advocated a parkway beside the river when it was created in 1951. All they wanted was a permanent parkland area. We are still looking at YOUR dusty photos for our book. It's really easy. Scan and upload to Dirty Old Boston. Think You Got It Bad?